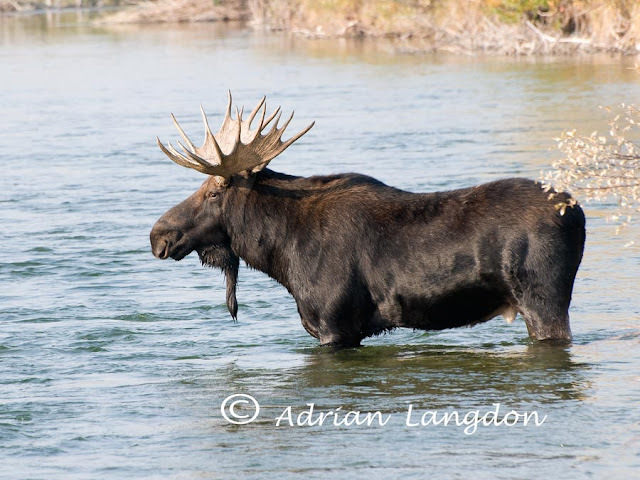 Bull Moose crossing the Gros Ventre River in Wyoming. This is the first time in 2 weeks that I've had access to the internet as I've been in Yellowstone & Grand Teton National Parks for that time and have been gratefully incommunicado! 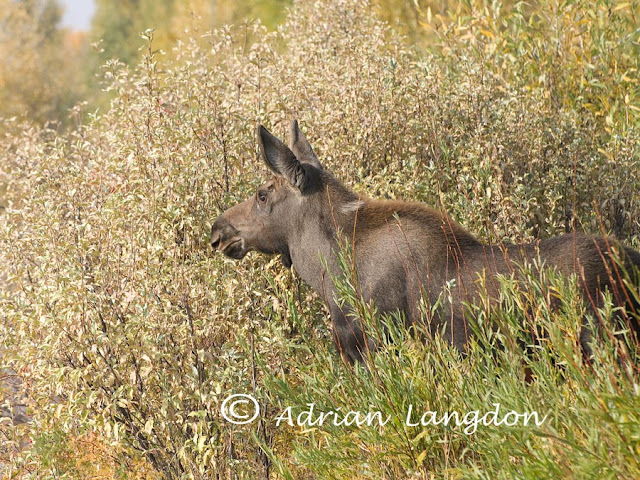 We initially stayed at the Gros Ventre campground in Grand Teton just north of Jackson Hole in Wyoming and as we'd stayed here before we knew it to be a promising place to get some good views and photos of Moose. 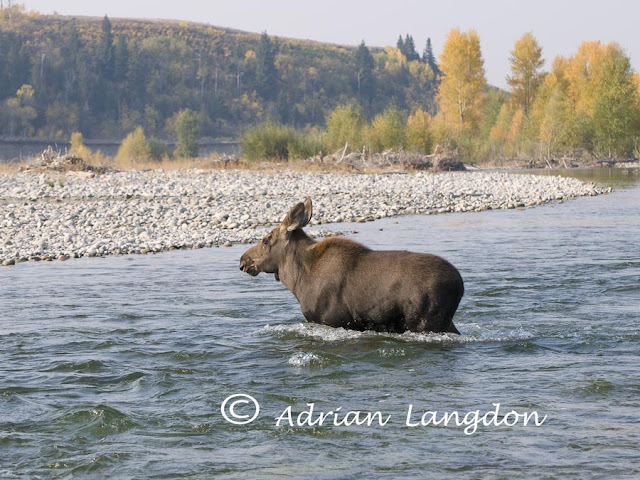 We were not disappointed and over 2 days I watched a bull, cow and calf along the banks of the Gros Ventre River at the back of the campsite. I watched as the cow made her way across the river, followed by the bull, leaving the calf on the opposite shore and calling for it's mother. Eventually she looked through the willow scrub across the water and spotted Mum feeding and decided to risk the river crossing alone. Here are just a few of the photos I took in fantastic early morning light and very close to the animals as they decided to cross very near to our vantage point. It was a sight that will stay with me for a long time to come! 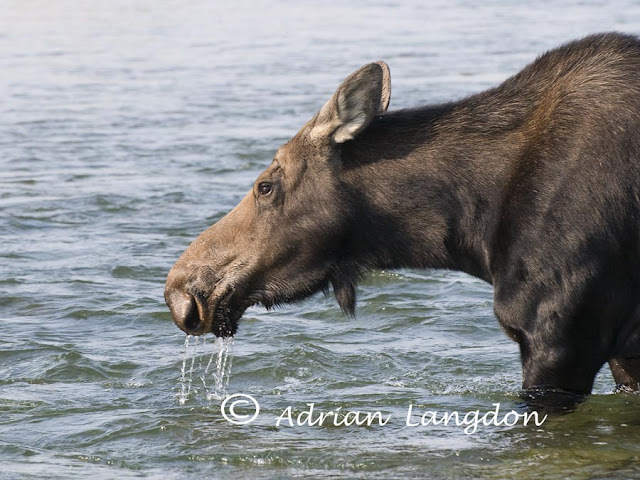 Female Moose pausing to drink as she crosses the Gros Ventre River in Wyoming. Moose calf calling to mother on opposite shore of the Gros Ventre River in Wyoming. Moose calf crossing the Gros Ventre River in Wyoming.